Lower line is global temperature, upper is CO2. from 1950 to 2020. The lack of correlation is obvious. I was at professor Salby's lecture yesterday. It is dealt with by Mike Haseler on the SCEF blog and I cannot improve on that. But having seen the case put forward by Prof Salby I cannot reasonably say “I assume the rise was man-made”. But much worse! Without properly assessing the evidence I cannot properly say he is right – that the CO2 rise does not appear man-made. ..... I could well do without another finding another bit of climate “science” which is rubbish. Another aspect of the global warming argument that is junk. Another aspect I will have to research. Another hold-the-nose and try not to breath in stench filled crawl through the hateful underbelly of global warming non-science trying to find any kind of evidence against what Prof Murry Salby said. 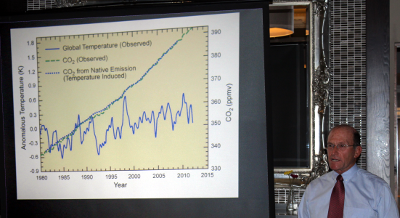 "(the lecture was about) the rate of CO2 emission correlates almost perfectly with temperature and barely in any way with human production. This means it is a natural phenomenon not a man made one. The lecture was videoed and I assume will be online in due course. Interesting. Were I to try to “prove” GW with correlations, I’m sure you’d be the first to say “but correlation doesn’t prove causation”. But probably more importantly: is you choice of word “emission” correct, here? Emissions are quite hard to measure, other than from anthro: what is very well known is the atmospheric CO2 concentration. If he/you really did mean “emission” I’d be curious to know his sources for that information. Thank you for that remarkable concession. Your question is malformed, but I agree that correlation doesn’t prove causation. Fortunately, the arguments for GW (including CO2-is-anthro) don’t involve that, so I have no problem. The person who appears to be using correlation here is you, in your report of Salby. And whilst attack may be entertaining and diverting, it doesn’t serve at all to defend what you’re saying. Meanwhile, you haven’t provided the requested clarification; see my last paragraph. None of the arguments for CAGW have ever involved relating the rise in CO2 with rising temperatures (in that era), or at least none produced by honest people.